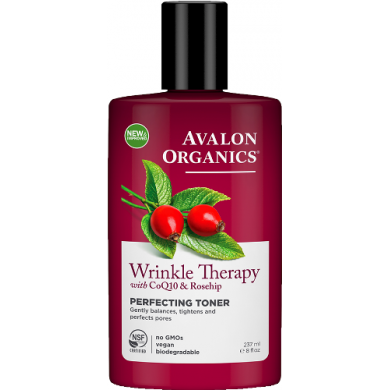 Avalon Organics Wrinkle Therapy Perfecting Toner with CoQ10 & Rosehip purifies and tightens pores, rebalances natural moisture levels and fortifies skin with antioxidants. This product replaces CoQ10 Repair™ Perfecting Facial Toner. 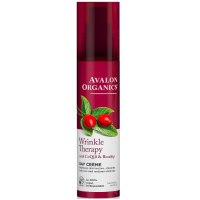 The new and improved formula now contains antioxidant-intensive rosehip oil for added wrinkle-fighting benefits. 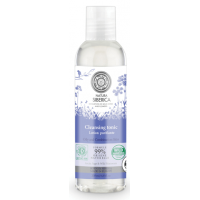 How to use: Gently sweep a moistened cotton ball over freshly cleansed face and neck to firm and rebalance skin. 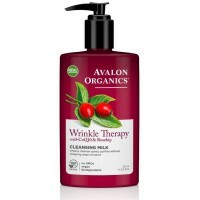 Following with a Wrinkle Therapy moisturizer completes a regimen. Ingredients Aqua (Water), Aloe Barbadensis Leaf Juice(1), Glycerin ,Quillaja Saponaria Bark Extract(1), Caprylyl/Capryl Glucoside, Citrus Aurantium Dulcis (Orange) Peel Oil, Citrus Limonum (Lemon) Peel Oil, Lavandula Angustifolia (Lavender) Oil, Rosa Canina (Rosehip) Seed Oil(1), Arnica Montana Flower Extract(1), Camellia Sinensis Leaf Extract(1), Chamomilla Recutita (Matricaria) Flower Extract(1), Lavandula Angustifolia (Lavender) Flower/Leaf/Stem Extract(1), Leucojum Aestivum Bulb Extract, Salix Alba (Willow) Bark Extract(1), Beta Pinen, Citric Acid, Glyceryl Caprylate, Linalyl Acetate, Polyglyceryl-5-Oleate, Ribose, Sodium Cocoyl Glutamate, Sodium Hyaluronate, Ubiquinone (CoQ10), Alcohol(1), Calcium Gluconate, Gluconolactone, Sodium Benzoate, Limonene, Linalool. (1)Certified Organic Ingredient.